Major P. M. Larken, the District Commissioner for Yambio District (1911-1932), sitting on the ground with his arm around a girl, with a boy next to them. In front of them is a carved stool, and in the background a sleeping hut (type known as gbuguru). Morton, Chris. 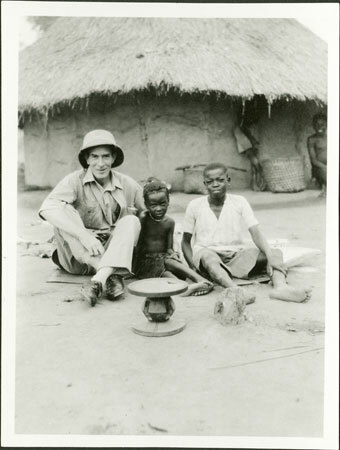 "Major Larken with two Zande children" Southern Sudan Project (in development). 03 Jan. 2006. Pitt Rivers Museum. <http://southernsudan.prm.ox.ac.uk/details/1998.341.303.2/>.